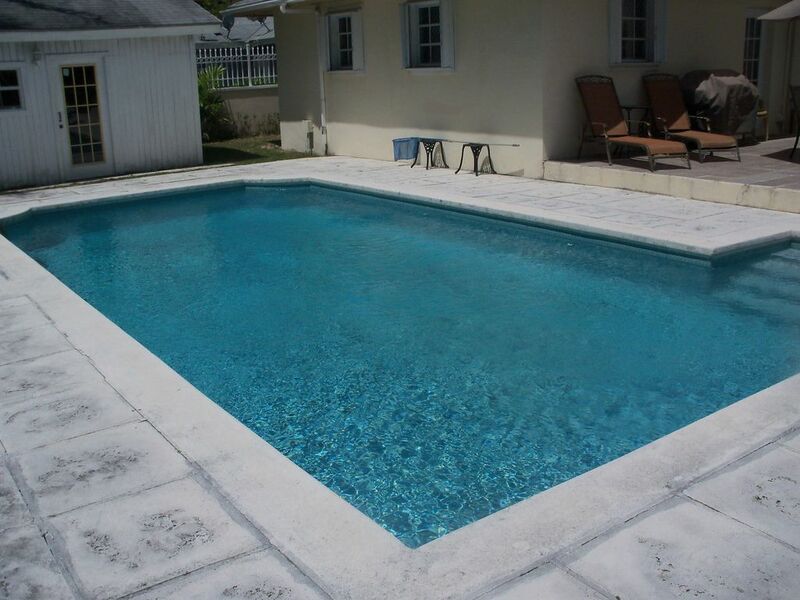 This beautiful apartment is located in a two story house situated on a large property, located on quiet Hampshire Street, only a 3 minute walk from the beach at the edge of the turquoise blue Bahamian sea on Cable Beach in Nassau, Bahamas. The owners Armin and Vernice Wernli, live on the premises. You can rent the beautiful, spacious, self-contained 2 bedroom apartment in one week units, starting Saturdays. It is fully air-conditioned, has a modern kitchen with all appliances (with dish washer), a dining area, sitting area with big TV. Cable service, Telephone and wireless broadband Internet are at your disposal free of charge. The livingspace of the apartment is about 850 sqf. The weekly rental is USD 1,200.00, inclusive electricity and water. Upon request, we can arrange for full maid service. There is a laundry room with washer and dryer at your disposal at a small charge. All rentals start and end on Saturday's. Payments: 50% of rental and USD 300.00 security deposit are due with sumbission of Rental Agreement. The balance of rental is due 60 days prior to arrival. Form of payment: Bank drafts or cashier's cheque, wire transfers or transfer via Western Union. Walking distance to bakeries, food stores, post office, restaurants, bank, ATM etc. Wir sprechen deutsch.Smoking is not permitted in the unit. This home is the perfect vacation rental. Everything was clean and the owners, Vernice and Armin, thought of everything! It was even better than the pictures! There were four of us (two couples) and we had the best time in the Bahamas. The private pool was our favorite part, it was so nice to jump in whenever you wanted and relax on the patio. The neighborhood is in a great location, safe, minutes from the beach and an easy bus ride to practically anywhere. Armin is a fantastic pastry chef and we had a lovely “last night” on the patio with wine and good friends. The next day was our flight home. We had our return flight get canceled late in the evening, around 9:30pm. We got no help from the Airlines (American), but we called Vernice and she and Armin not only came and picked us and our luggage up from the airport, but they helped us located a last minute place to stay for the next two days until we could get a flight out. They went so above and beyond on so many things, I am so happy we chose their rental. We could not have asked for a better place to stay or better people to rent from. The morning we were headed back to the airport Vernice again helped us out, drove us to the airport and made sure we got out ok. Thank you Vernice and Armin, you guys are the best! Clean, comfortable and quiet place. True to the photos. Armin and Vernice were very hospitable, knowledgeable about the area and quick to respond to any questions. We have only wonderful things to say about our visit to this lovely property. Hosts Vernice and Armin are charming and delightful people. They made sure we were comfortable at all times while ensuring our complete privacy. The home is very comfortable and well appointed with all amenities. Television and internet service is top notch. A dip in the private pool was a fabulous way to cool down after long hot days at the beach. And it was truly luxurious to lounge poolside in the sun with a drink in complete seclusion. The Cable Beach location couldn't be better. It is within easy walking distance to a nearby stretch of shops and restaurants including grocery and liquor stores. All in all, our Bahamas experience at Vernice and Armin's terrific spot exceeded our expectations. Five stars! We enjoyed your company and looking forward to your return. First impressions as you pull up to a very well maintained and inviting property. Vernice and Armin are very welcoming and are very accommodating to all of your families needs from answering any questions to giving directions or just simply enjoying a warm chat. This is our families 2nd time with Vernice and Armin and it's like visiting long distance friends. The house is beautiful with a bohemian style and ample space for a family.I might mention that on last evening of each visit they end our stay with scrumptious pastries from there own bakery that are just to die for and a bottle of wine. Our family will definitely be returning in the future. We spent an amazing week in paradise! We traveled with our three teenaged sons and enjoyed every minute of our stay. The location was amazing and the house had everything we needed and more. Easy 5 minutes walk to beautiful beaches and all amenities such as grocery store, pharmacies etc. If we wanted to venture any further away, the bus was very close and easy to catch. The area felt very safe and very quiet. Vernice and Armin were very accomadating and always willing to help out. They even brought us wine and delicious treats from their pastry shop and we spent a very enjoyable evening getting to know them. I would definitely recommend this vacation rental to friends and family and would most certainly come back! We had the joy of staying 7 days at this place and we loved it! Kids loved the pool and we took the bus to Saunders Beach when we needed some beach time. Busses are really easy to use. The house was clean and had all we needed and the friendly hosts gave us all the help we needed. We would recommend this place anytime!